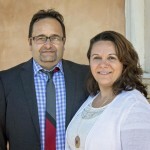 Pastors John and Michaela were both born in Romania and have been happily married since September 1993. Both were saved at the tender age of 15, and were later filled with the Holy Spirit in 1991. Soon thereafter, they began leading youth in song and ministry for a 1,200 member church in Arad, Romania. They’ve been singing and leading worship together for over 20 years and have produced multiple praise and worship albums. John was ordained a pastor by Emanuel Worship Center of North Carolina (part of Grace Covenant Churches) in 1996 while visiting the United States. The Bligs immigrated to the United States to join John’s family in 1999. Since then, they’ve both graduated from Charis Bible College Chicago. They have three children, Jason, Melody and Harmony. The Bligs were missionaries to the Czech Republic with Harvest International Ministries. In 1994 they began working with ARC Ministries and planted four churches in Romania, trained leaders, pastored two of the new churches, led worship in national conferences, and led stadium evangelistic crusades. John and Michaela moved to San Antonio purely because God called them here to plant a church. Mark and Genetriz Tourtellotte both served and are retired from the United States Navy. Mark was born in McCook, Nebraska, and joined the Navy out of high school. He served from 1974 until his retirement in 1995. Mark and Genetriz were married in Dededo, Guam, in April 1995, shortly after his retirement. Genetriz was born in the Philippines. She immigrated to the United States in 1980 and joined the Navy in 1981. She served until her retirement in 2008. Genetriz’ last assignment was as Command Master Chief of NAS Kingsville, Texas. After Genetriz’ retirement, Mark and Genetriz moved to Spring Branch, Texas. In December of 2010, they found Oasis of Light Church. Mark and Genetriz have faithfully attended and served in Oasis of Light Church in various capacities since that time, and now currently serve as Elders. Yolanda was born in Laredo, Texas but has lived in San Antonio for the past 20 years. She has three children and 9 grandchildren, which mean the world to her. As a former public school teacher, then later an IT manager for St. Philip’s College, she now devotes all her time to the ministry of the Lord. 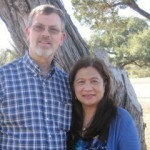 Yolanda is a Charis Bible College graduate and now works for Charis Bible College San Antonio. She conducts Charis Bible Studies in her home twice a month. Having a personal relationship with Christ has made all the difference in her life. The main focus of her life is the Lord. There is nothing more important than knowing who God is and who one is in Christ. Her passion is to see people established in their identity in Christ, knowing God as their Father, who loves them unconditionally.